I decided to go to a gig within Leeds which I haven't done for a long while so I thought I would talk to you today all about the gig and why you should support the amazing artists that were performing at the gig. All photographic credit to Rachel Kiki. Photo was sent by Danny Gruff. Essex born singer songwriter Dave Giles. 31, started his path into the music industry by being the guitarist/'the cheeky onehin a rock indie band which lasted up until 2010 when the band decided to go their own separate ways. Dave decided to become a one man act and released his first EP which was dubbed 'The First Seven' which was released within October of 2010. As you can tell by the title of the debut EP, it consisted of seven tracks. He released all of his solo music under his own record company Cheeky Chimp Records Ltd. If you were going to put Dave's music under any sort of genre then it would probably go under acoustic folk with a cheeky twist. Dave is an amazing person on and off the stage. He also has a YouTube channel if you want to check out his stuff then click here or if you want to buy any of his music then just click on the words. Wrexham born singer songwriter Danny Gruff got his big banging break after supporting acts like Bastille, Frank Turner and Bastille to name a few. Within 2015, Danny created a project which was dubbed ONTAW which consisted of releasing one new track a week for a year which then led him onto a 2 official UK tours including a first headline tour. Danny is planning on releasing his first album which will hopefully be released around March 2017. Danny is known for his cheeky yet friendly 'lad banter-esque' personality and studied at a prestigious university within Leeds. He also has a YouTube and music which if you want to check out then I will link the words so all you will need to do is click on them and they will go straight to the source. This particular gig, which is one of many in the Onomatopoeic October Tour, was hosted in the indie influenced Verve Bar which is located within the slight outskirts of the city centre. The other bars that surround the Verve's location include Manhatta, Bar Soba and many more. I ended up at the venue a tad bit early so I decided to grab a drink with the guest that I dragged along to the gig. We decided to grab a cider and sat down next to a candle lit table and a spacious window looking out towards the other bars. We made our way downstairs and was instantly greeted by the bubbly and wonderful Dave, we hugged and chatted briefly and then made our way to where we would be watching the gig from. Within a few minutes, the two amazing people tuned the musical instruments. They talked and joked about the previous night on the tour and got myself and the rest of the audience to chant things such as 'Leeds. Leeds, Leeds.' They both created a bubbly yet chilled out atmosphere to help the performances go off with a bang. They flipped a coin to see who would go first and Danny got the heads up and went first. Danny talked about his project and performed hits that showed a mixture of empathy, love and cheekiness. He told us about how Dave and himself compared their top hits on Spotify and Danny's was a collaboration with Dave which myself and the audience chuckled at. He also created a three song set that were influenced by his student life spent within in Leeds which included the infamous Hyde Park which is within Leeds. I also urge you to listen to the songs that he released within the ONTAW project as they are all amazing! Dave then came on stage and flew some brotherly banter across the venue which was received really well. He talked a bit more about the previous night that was spent within Norwich. He then started to play songs which had charisma and cheek within. He then talked a bit more about the fact that the tour was on a pay what you feel basis which I loved the idea of as it shows that every penny counts but at the same time it also means that any member of the public can come along. There was a intermission after Dave's first set which I decided to go to not out of rudeness but due to having muscle pain and because the guest that I was with wanted money to get a piece of merchandise but by the time we tracked down a cash machine it seemed a bit stupid and a bit tiresome to run back up to get the merchandise so I suggested that they got the merchandise off of Dave's and Danny's websites. find the ones that you love. This isn't a sponsored post. 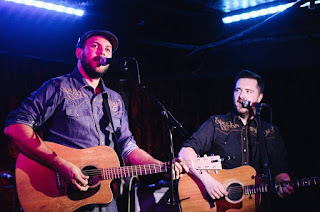 I have done this slightly rambly post as I think that these two terrific lads should definitely have more support and recognition than they already have as they are both so dedicated musicians and two of the most loveliest people that I have ever met! I hope that you have enjoyed this blog post. Please go and check out Dave and Danny! I hope that you come back next time for another blog post!